Caution: if you are allergic to hearing runners go on and on about their insane weekly mileage, negative splits, PRs, aching quads, hitting the wall, and/or carb loading, stop here and go outside and enjoy the company of a neighborhood critter. Otherwise: read on . . . ’cause I finally ran a race! Since this new year is off to a much more fabulous-free-flowy running start, I was happy to discover that the generous race promoter of Rock It Racing would trade an entry for some help before/after the race . . . perfect for our tight sabbatical budget. So . . . I got up a little earlier than usual last Saturday, and made it to the race site (Whiting Ranch Wilderness Park) by 6:15 am to unload supplies and then work the sign-in table. It was a pleasure to meet and assist so many cheerful trail runners! The 12k race began at 8:15, so about 8 am I left my post in the good hands of another (non-racing-that-day) worker, and went to my car to remove my socks, sandals, fleece hat, sweatpants, down vest, and a few other layers–while it had been a bit chilly for standing around for two hours, this was perfect running weather! After a few sets of 60 crawling “steps” (which I tried to do away from the crowds, as it still feels a bit odd to “crawl in public”) I was warm and ready to run. We all headed over to hear the last minute race directions. “Yellow flags” . . . something something . . . follow the yellow flags,” was about all I could hear from the crackly bullhorn, but that was enough. I knew there would be plenty of people ahead of me to follow, and even if I got lost, it was a beautiful cool and cloudy morning to run in circles for a couple of hours . . . and Whiting Ranch is not that big of a place, so I knew I’d be able to find the parking lot easily again. And yes, some of the fast folks in front did get mixed up when it came to the turn-around section of the course; even though they ran an extra mile or two, they still finished the race a half hour ahead of me. It was so inspiring to see them flying on by as I was trudging up the last incline before the turn-around . . . and most of them shouted out not only encouragement (“you’re almost to the top”) but also instructions on how to keep on course (“turn around when you see the three yellow flags”). On a sadder note: 12 years ago, Jan. 10, 2004, a mountain biker fixing his bike on the side of the trail was mauled and killed by a mountain lion here at Whiting Ranch. Not too many attacks in recent years, though, so I decided to go “minimalist” . . . no anti-mountain-lion sprays/bells/guns, no hydration pack, and absolutely no iPod-iPhone-FitBit-GPS-heart rate monitor-watch, etc. Not even my trusty little camera. Just me and my bare feet. The 12K (around 7 miles) course took me 1:27:20 to complete its seriously steep dirt roads and single track–and although I tried hard to keep my breathing controlled and only in and out my nose, I caved a few times and had to gasp my way up and up and up some sections. But the trail surface! Lovely damp sandstone with only a sprinkling of rocks here and there . . . over which I (literally? at least in the photo below) floated my way to the finish line (finishing 72nd out of 123 runners).
. . . and photobombing other runners along the way . . . (yeah, my wool long-sleeved t-shirt got a little warm on the never-ending uphills). Thanks to Foggy Bay Photos for the great shots, and to RockIt Racing for a well-run event. 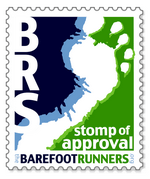 ← Barefoot running for six years: feeling grateful! Way to go! And you are “floating above ground.” Great shot. Way cool.